Non halal hotel Chinese restaurants are a dime in a dozen and Five Senses at The Westin is one of them. 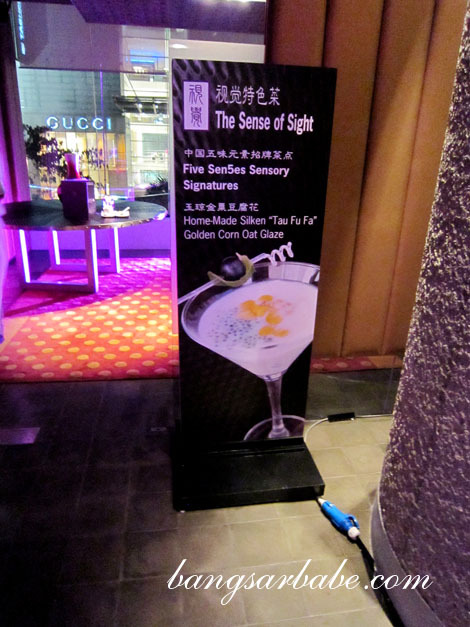 Reputed to serve contemporary Cantonese cuisine and delicious dim sum, in a chic and classy décor, the element I found most interesting about Five Senses is its concept involving the give human senses, SIGHT. TASTE. SCENT. TOUCH. SOUND. 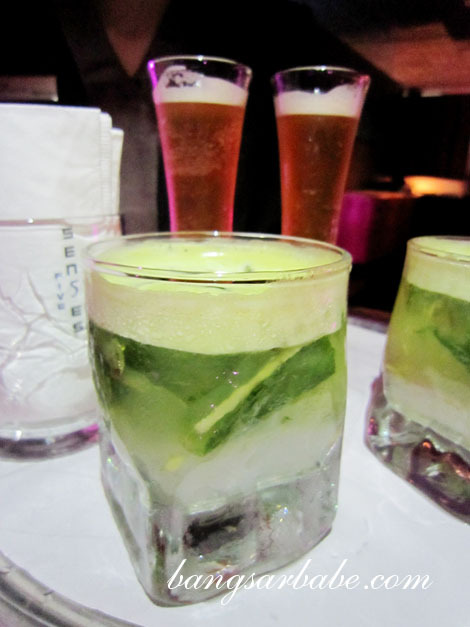 These five elements are present in Five Senses’ signature dishes and diners will get to enjoy the experience on weekends – Friday, Saturday and Sunday. 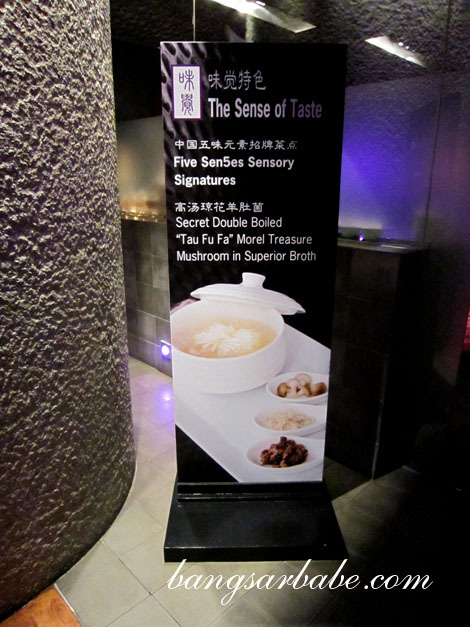 We started with the Sense of Taste, were I tucked into the secret double boiled tau fu fah morel treasure mushroom in superior broth (RM45). 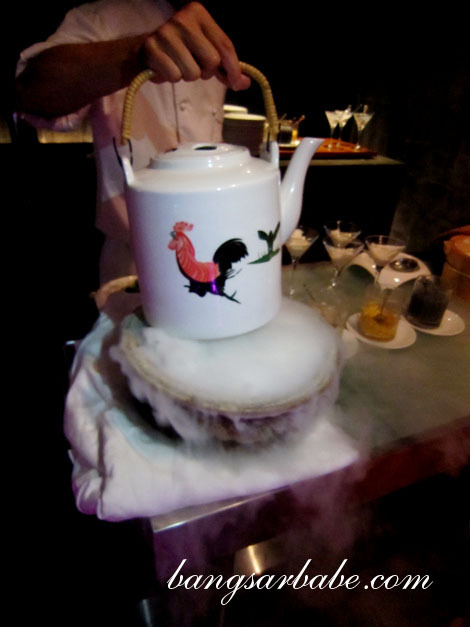 I liken it to be a savoury version of the flower tea, as the tau fu fah was the flower and the broth acted as a tea. 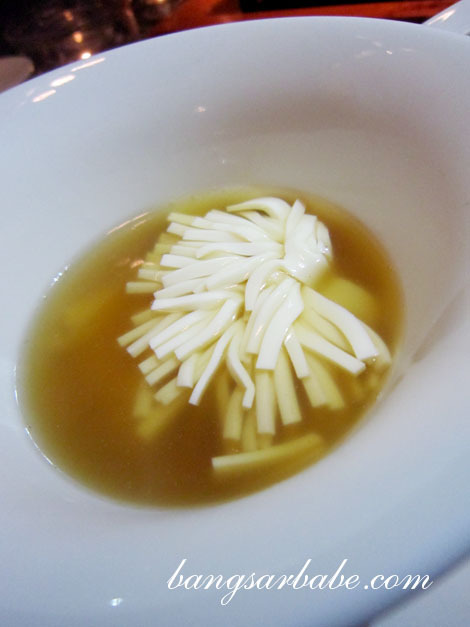 The broth was light yet full of flavour – almost like an essence. 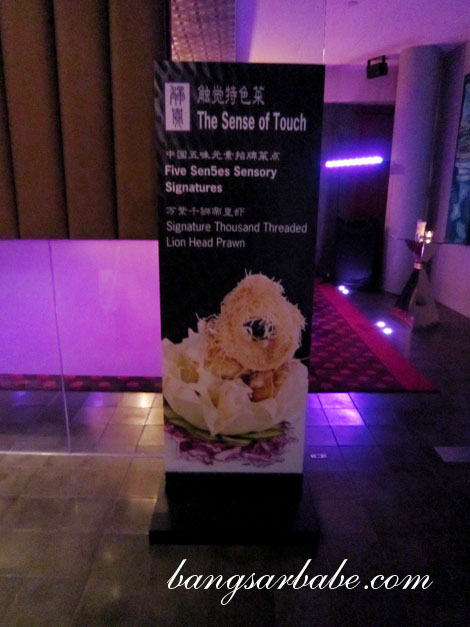 Next was the Sense of Touch – signature thousand threaded lion head prawn. 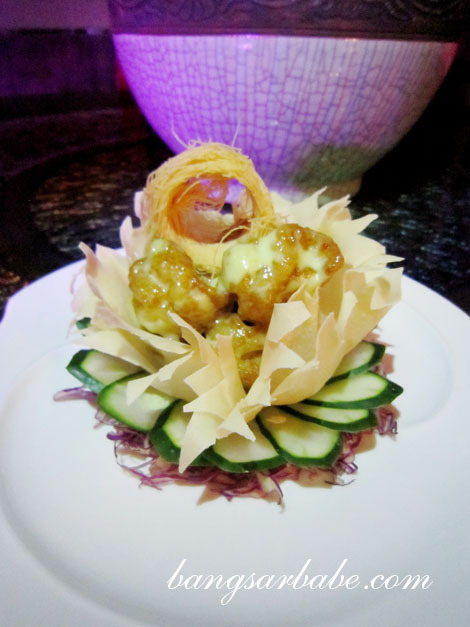 This comprised a crisply fried prawn on a bed of katafi, and topped with wasabi mayo. 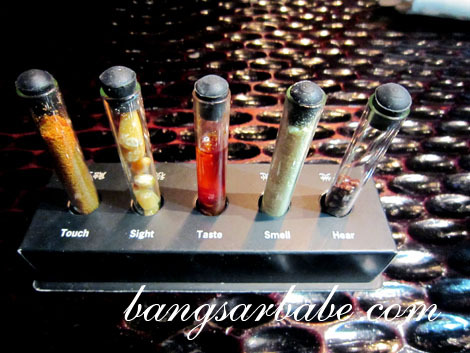 The Sense of Smell was one of my favourites, despite my indifference to petai. 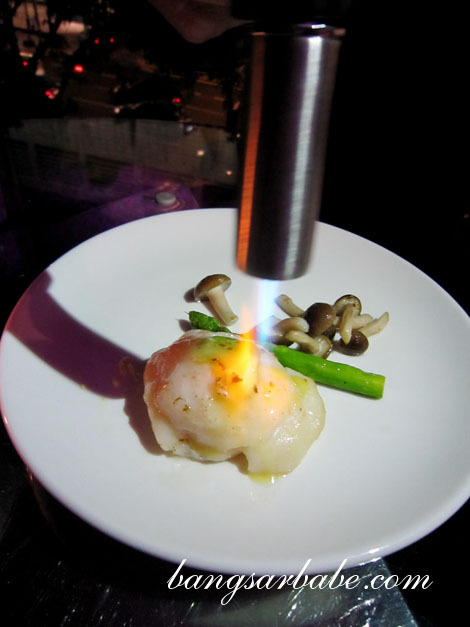 The scallop was first seared to obtain a crisp edge and the chef finished the dish by torching the petai lightly. 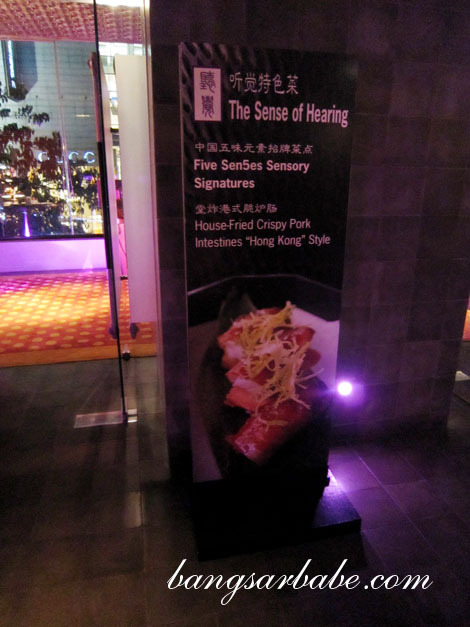 I’m no fan of intestines, but the house fried crispy pork intestine Hong Kong style from the Sense of Hearing was good stuff. I ate eight (yes, eight!) of these and actually wanted more. 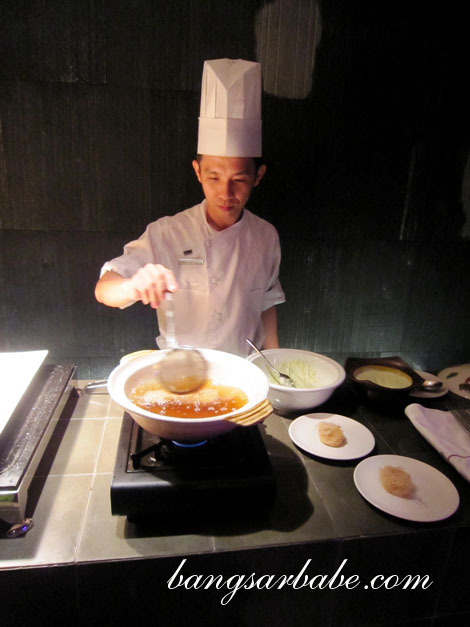 Finally, the Sense of Sight – homemade silken tau fu fah with golden corn oat glaze. After the samplers, rif and I sat down for a sit down dinner and left the restaurant feeling (and looking) like a stuffed Christmas turkey. The Sichuan hot and sour soup with fish skirt (RM25) was perfect for rainy nights. 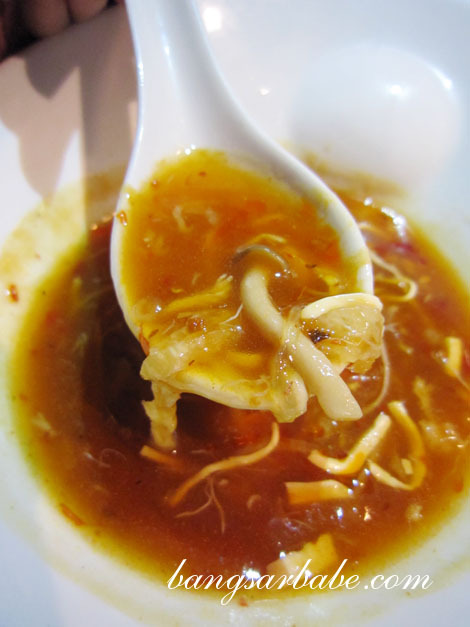 It was all my favourite flavours – tangy, spicy and sour – in a bowl. Also tasty was the Signature Abalone Dumpling in Hunan Ham Bisque (RM30). The bisque was thick, nicely laced with egg and complemented the dumpling. 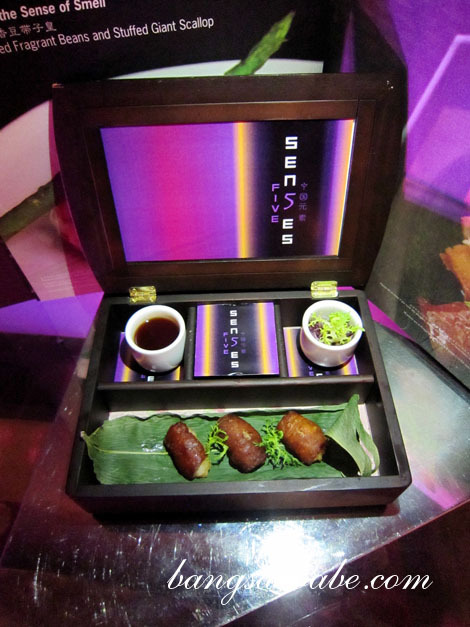 Another noteworthy dish was the Honey Glazed Black Cod in Teriyaki Jus (RM68). 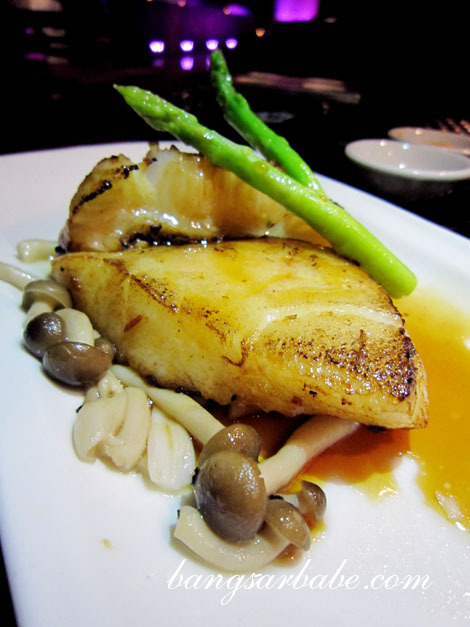 The cod was smooth and tender, with a sweet-savoury coat. 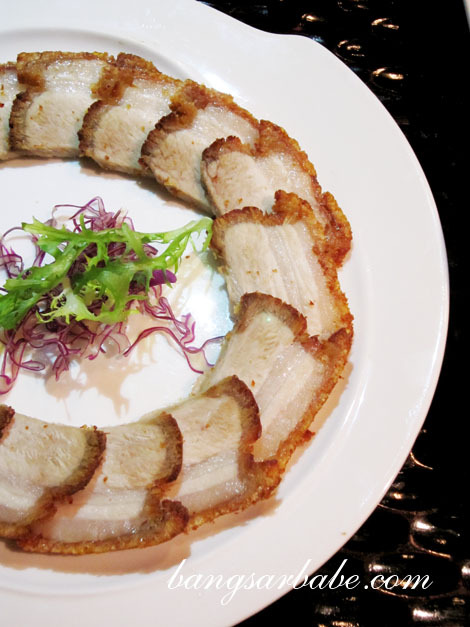 And don’t forget to try the Secret Homemade Crispy World Class Pork Belly (RM33) which was a beautiful composition of porcine delight. 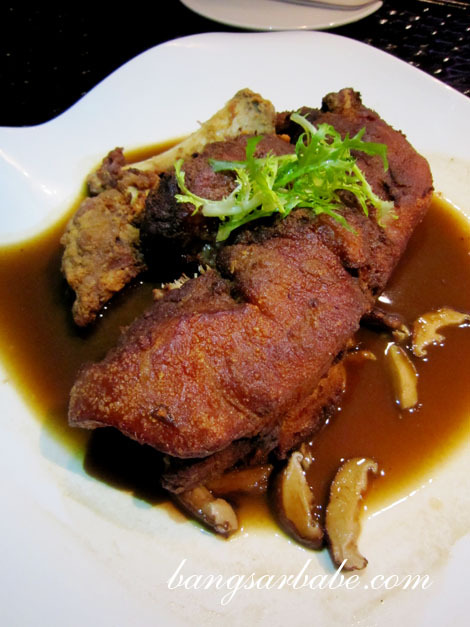 Being ambitious, we ordered the Secret Method Australian Pork Trotter (RM39) that featured a crispy pork knuckle in a base of brown mushroom sauce. This was not bad at all, but I liked the pork belly better. 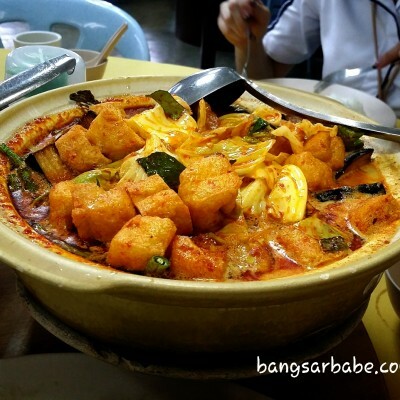 For our greens, the King’s Style Four Signature Vegetables (RM25) was lovely. Especially with white rice. Yes, I couldn’t resist ordering a bowl of white rice. We finished everything except the knuckle bone, to the astonishment of my waiter and still ordered dessert! 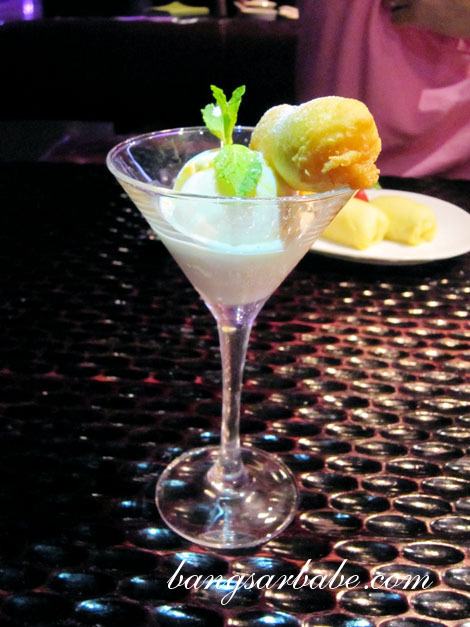 Ginseng creme brulee fritters with honey mandarin ice cream (RM25) was most interesting. I liked the slightly bitter aftertaste, which paired well with the slightly tangy ice cream. 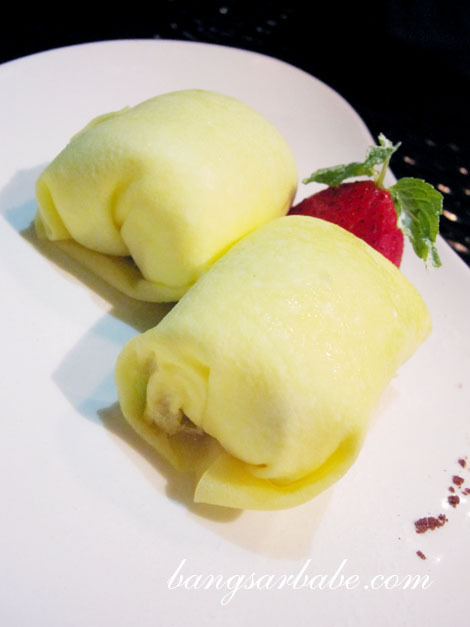 Fans of durian should order the Signature Fresh Durian Pancake (RM12) which boasted a layer of cream and durian puree. 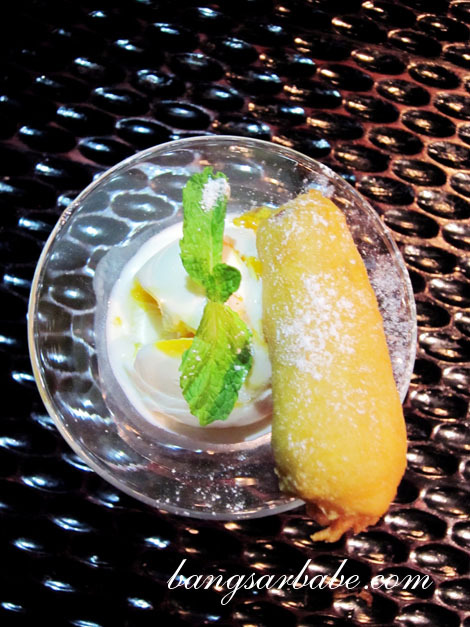 This was less decadent compared to other durian pancakes, but to me, a lot more tolerable. All in, I was pleasantly surprised by the food. And the Director of Kitchens – Garth Welsh – was … well, quite the eye candy. 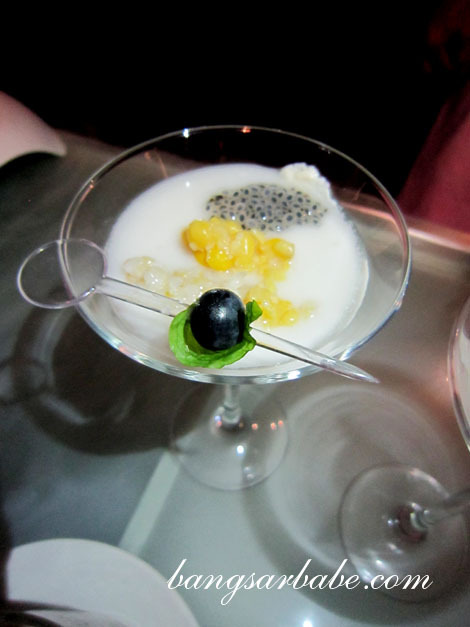 Verdict: I liked the concept and was quite impressed with the food.